Kaigun Kare, directly translated as “Navy Curry” in English, is the hearty, mildly sweet and spicy gravy dish served up in mess halls and ship galleys every Friday in the Japanese Maritime Self-Defense Force (JMSDF), or the former Imperial Japanese Navy (IJN). While the exact time of when having Kaigun Kare in the Japanese Navy came to be is debated, it is generally accepted that Navy Curry was adopted in the Imperial Japanese Navy around the late 19th Century during the Meiji Period (1868 – 1912) from the British Royal Navy, as a result of the growing problem of beriberi among Japanese troops and sailors at the time. This nutrient deficiency was caused by a lack in the vitamin thiamine, stemming the Imperial Japanese military’s recruiting promise offering an “unlimited supply” of short-grain white rice to attract men in enlisting. As pure white rice was viewed as a sign of wealth and high social status at the time when Imperial Japan was still segregated by social classes, men ate heaps of it and little of anything else for their meals. When the British expeditions introduced curry to Imperial Japan in the late-1860s, the Japanese found that the curry did not go very well with the sticky, mildly aromatic glutenous Japonica rice. Thus, they experimented with methods to tweak the curry recipe to suit the local palette. Navy Curry contained the essential thiamine, thus the Imperial Navy decided to include curry rice as part of the military diet in 1908, accompanied by salad and a glass of milk in an effort to tackle malnutrition after studying how the Royal Navy served curry to sailors. The Imperial Japanese Army had not caught on with their Navy counterparts in the dietary change, and the practice of serving thiamine-free white rice resulted in thousands of Imperial Japanese Army soldiers falling out of the fight during the Russo-Japanese War at the turn of the century. While there may be slight variations depending on the region, Indian curry generally is a ‘wet’ curry – it has a soup-like gravy consistency and is made from an array of spices which include fresh or dried hot chili pepper, garlic, cumin, turmeric, cinnamon, coconut and sometimes even saffron. These spices are added one at a time to the broth as it heats up, mixed well and then stewed over time to bring out the distinctive flavour. It is typically cooked together with lentils and vegetables like eggplant, gourd or okra. Indian curry is usually served with Chapati (unleavened flat-bread; also called “Roti” if made thicker) or Naan and sometimes long-grain Indica rice as an alternative to the flat-breads, or with chicken, mutton or fish as a meat dish. Japanese curry, on the other hand, is a ‘dry’ curry that has a thick consistency resembling that of a slightly watered-down sauce. It does away with the hot chilies and coconut, but retains the other essential spices in the form of a powder and adds beef fat to the mix to create a starchy gravy. This differs from the Indian and British style curries, with British curry using flour instead of beef fat. The Japanese substituted beef fat or katakuriko potato starch in place of flour as a thickener because flour would go bad in a high moisture environment such as on-board a ship. Flour was generally reserved for bread making or used as a thickener on land. As such, Japanese would use their own beef for both the fat and meat for their curry dishes. Kosher salt, turmeric, cumin, coriander and cardamon spices are used in Japanese Navy Curry to keep its shelf life for longer while the ship was at sea. Another key difference is that Indian curry would never use beef because it is forbidden to consume, as cattle are held sacred in Indian belief. Japanese curry is usually served on a bed of pure white Japonica rice, that has a sticky texture and mild aroma as compared to the hardy Indica rice served in Indian curry dishes. It is worth to note that Japanese Navy Curry can vary somewhat in taste from vessel to vessel, as each ship galley puts their own unique twist into the mix as a morale booster. One such special ingredient is honey, as found in the Navy Curry on-board the Yaeyama-class minesweeper vessel JS Hachijo. Not all Navy Curry recipes will include honey or tomato ketchup, which add more of a sweet or tangy flavor to the meals. Japanese Navy Curry has gone from a seafaring routine to a one-pot wonder on the mainland. Inspired by the Imperial Japanese Navy’s 1902 recipe book, curry eateries sprung up and began serving the naval dish in Yokosuka post-war. Popularity grew, and soon people who were not even serving the Navy or living on base were coming to eat Navy Curry dishes. In 1968, one particular food research company called Otsuka Foods was struggling to come up with a solution to sell their Navy Curry powder and premix roux bricks. In February of that year, one of Otsuka Foods’ product line developers was inspired by an article on Swedish Army pouch sausages, and developed a special packaging known as a retort pouch. This was a revolutionary method of packaging food; it was made by laminating several layers of heat-resistant plastic and aluminium films, which were filled with the ingredients and then sealed and heated to over 240 degrees Fahrenheit (115 degrees Celsius). The high heat and pressure rendered the pouch aseptic and kept the contents sterile, while the flexible laminates ensured the food’s freshness for up to two years. Thus, Retort Curry was invented and helped Otsuka Foods drive sales up to 100 million pouches per year in just five years. This method of retort packaging went on to see use not only in Japan, but also in instant meals and food rations around the world. Most notably, the U.S. military adopted the retort pouch system of packaging for their Meals, Ready-to-Eat (MREs) in the late 1970s. 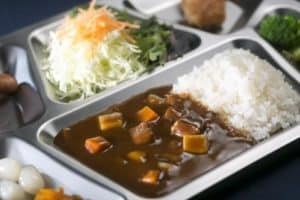 Japanese Navy Curry was born out of necessity in hard times and played a major role both in sustaining the military, as well as bringing smiles to civilians around the world with its hearty fill, easy-cleaning consistency and unique taste.